To state the obvious, I am not usually a fan of low-fat desserts. I love butter and cream and eggs, and now I’ve even devoted a blog to combining them in as many ways as possible (I’m still not sure this is a good idea.) 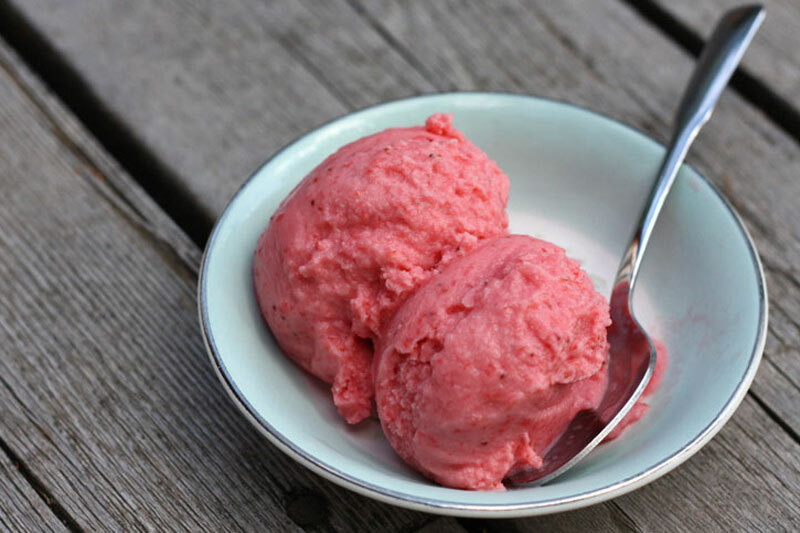 But although frozen yogurt is also considered a low-cal alternative by many people, I actually love it – it’s not an ice cream substitute, it’s an entirely different concoction, delightfully tangy and light and refreshing. It also has enough sugar in it to make any health food label a bit of a stretch. I usually like my ice cream to be rich and decadent and studded with chunks of deliciousness, preferably in cookie dough form. But frozen yogurt is beautifully suited to fresh fruit, and I caught one last gorgeous batch of local strawberries to make it. It’s one of the easiest desserts you can make as long as you don’t mind waiting a few hours: let berries macerate in sugar, chill with yogurt, freeze in ice cream maker. 10 minutes of labour gets you a brilliantly coloured, slightly-less-bad-for-you dessert! Incidentally, I accidentally took this even further off the healthy spectrum when my hand slipped and I added about three times as much vodka as I meant to. Oops! I was concerned at first, since the purpose of adding alcohol is to prevent the yogurt from freezing too solidly, but with the amount I used it actually stayed a perfectly good consistency. I don’t know that I’d recommend it, though – people, be careful with your vodka. Hull the strawberries and slice into small pieces. Gently stir in sugar and vodka, until sugar starts to dissolve. Cover and let stand at room temperature for 2 hours, stirring occasionally. 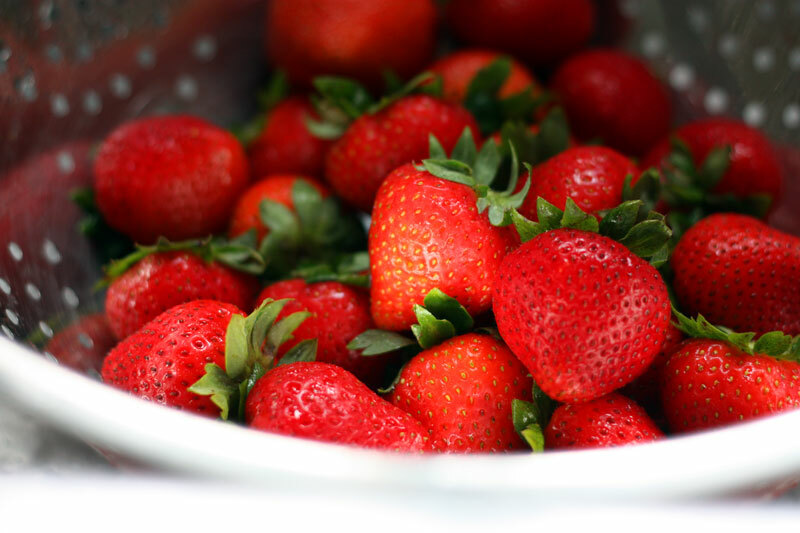 Transfer the strawberries and their juice to a food processor, and add yogurt and lemon juice. Blend until the mixture is smooth. If you like, strain the mixture to remove the seeds (I don’t bother). Chill for 1 hour, then freeze in ice cream maker. We love greek yogurt and strawberries. I will be making this very soon. I love the tip from the vodka, lol! 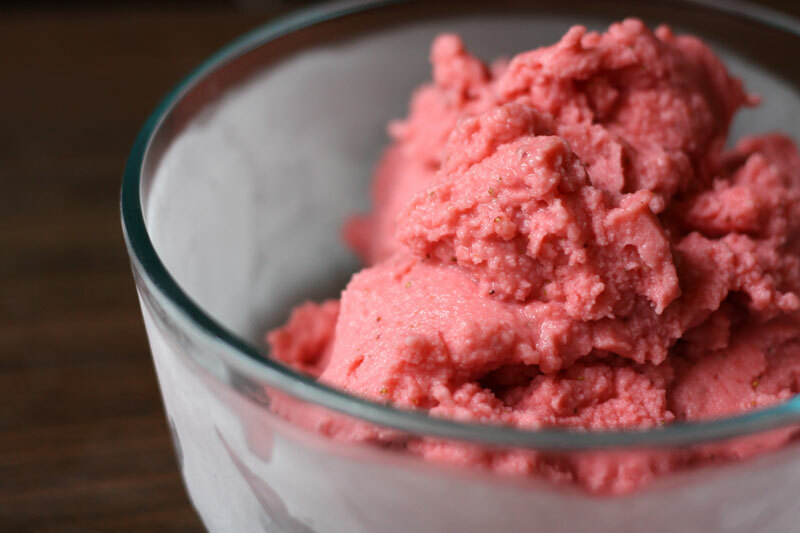 I made this frozen yogurt a couple of days ago and simply loved it! I’ve just published the recipe on my blog with a link to your page. The recipe is in portuguese, but if you want to take a look you’ll ses how delicious it looks in the pictures! Thanks for sharing! You are currently reading strawberry frozen yogurt at one cake two cake.